This collection by Troupe Americanistan, based in Eugene, Oregon, contains nearly 73 minutes of music in 15 tracks. 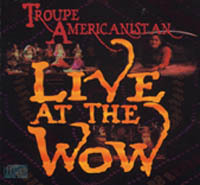 Recorded live at the WOW Hall, most of the music consists of original compositions by group members based on Middle Eastern rhythms and stylings, although there are a couple of familiar Arabic songs included. As I listened to it, I found myself thinking in terms of using this music in conjunction with American Tribal Style costuming and dance rather than nightclub style. Although there are a couple of tracks that don't excite me, overall I feel the album has merit for dancers who enjoy original music that has an ethnic flavor. This musical collection is dominated by violin and flute, although some other instruments are featured on selected songs. Most of the songs were composed by members of this musical ensemble, but there are three familiar ones: "Aziza", "Aya Zein", and "Habbena". This CD is an interesting change of pace from much of the belly dance music on the market, mostly due to the fact that most of the songs on it are original compositions by the performers rather than familiar melodies that originated in the Middle East. If you're likely to be appearing in a large belly dancing festival, you may like the distinctiveness of the music on this album, especially if you gravitate to the American Tribal Style or American Classic style of dance. Although "Aziza" is normally one of my favorite Egyptian songs, I didn't care for the musicians' decision to use a smooth, flowing interpretation of it with a lot of embellishment in places. I generally prefer to hear this song played with a crisp staccato style instead. On the other hand, I enjoy the "Sword Dance" very much, particularly the sense of power it conveys throughout and the musicians' skillful building from slow and dramatic to faster and energetic. I thoroughly enjoy the first 3 1/2 minutes of the Veil Dance which features a qanoun playing a lyrical melody line, but then it transitions into a flute playing jazz-like improvisation which really doesn't seem to fit with the first part of the song. The result feels like two completely different numbers that don't relate to each other crammed into a single track -- both the flute and the qanoun would have been more effective if this number had been separated into two distinct tracks, each with its own distinct beginning and ending. I am intrigued by how this ensemble interprets "Aya Zein". This traditional Arabic song is usually played at either medium-speed or fast tempo, with a strong percussion foundation, and as a result is usually most effective for entrances, finalés, or as a separator between two slow numbers. However, Troupe Americanistan gives it a much slower, more lyrical interpretation that makes me think in terms of using it for veil work. It is a fresh variation on an old song. You won't learn much about the music of the Middle East from it because most of the songs have been composed by members of Troupe Americanistan. Of the three that are well-known Middle Eastern songs, unfortunately, the liner notes give incorrect information about who composed one of them ("Habbena Habbena"). It attributes that song to Mohammed al-Wahab, but the composer was actually Farid al-Atrache. Although I like Troupe Americanistan's unique arrangement of "Aya Zein", it really doesn't represent what you would normally get if you asked a group of musicians to play that song for you. Still, educational value is only one dimension, and this CD performs well on other criteria. Chant 2:58 U.S.A. Yes No words, just vocalizations Okay to use for dancing because there are no religious lyrics. Beautiful, haunting male vocal. Habbena Habbena 3:31 Egypt Yes Yes After an opening pass through the melody, goes into an improvisation section that lasts about 1 1/2 minutes. Gypsy Willow 4:04 U.S.A. No Not applicable Maqsoum rhythm. Played on violin. An original composition by the violinist. Paulette's Beledi 3:27 U.S.A. No Not applicable Medium-speed maqsoum. Good for entrance. Solid rhythm for tribal-style group improvisation. Beat is strong, clear, consistently easy to hear. Serpentine 3:44 U.S.A. No Not applicable Starts with slow rhumba, with a flowing melody line. About 2 1/2 minutes into it, speeds up to medium-speed maqsoum. The band's own original material. Karshilama 3:24 U.S.A. Yes Not applicable 9/8 rhythm. Rich percussion section. Melody played on zurna, which gives a definite ethnic feel to the music. Composed by Jeff Rees. Sword Dance 6:54 U.S.A. Yes Not applicable Another of the band's own originals. Music feels very powerful, strong ethnic flavor. About 5 minutes into it, the tempo speeds up gradually and builds to quick 2/4 beat. Pan's Nine 3:43 U.S.A. No Instrumental 9/8 rhythm. Played on flute. Light, airy style. Aya Zein 6:31 Arabic Yes No Much slower than what most people play it. Several instruments take turns playing melody in call and answer format. Low-key, mellow. Maybe right for veil. Deena's Double Veils: Entrance Song 3:38 U.S.A. No Not applicable Maqsoum rhythm. strong beat, Good for group improvisation or beginning dancers. Deena's Double Veils: Flowing song 6:00 U.S.A. No Not applicable Starts with soft chiftetelli rhythm that gradually transitions into maqsoum. Drums slowly build while melody continues to flow. Deena's Double Veils: Drum Solo 2:00 U.S.A. No Not applicable The strong drum solo starts simple and gradually builds. Deena's Double Veils: Closing Song 1:00 U.S.A. No Not applicable Reprise of opening song. Veil Dance 6:41 U.S.A. No Not applicable For first 3 1/2 minutes kanoun plays melody line accompanied by other instruments. Then flute takes over with improvisational section. Drums gradually become stronger as the flute continues. Fades out at the end. Aziza 4:04 Egypt Yes No I usually like this song very much, but didn't care for this particular arrangement. Dunya's Goblet 6:13 U.S.A. No Not applicable 6/8 beat. Nice, strong drum beat. Flute & violin dominate melody line. About 3 minutes into the song the rhythm quietly fades and the melody instruments improvise. The rhythm returns for the ending. Drum Solo 1:20 U.S.A. No Not applicable This drum solo is very appealing. Clear, clean, crisp, steady beat. Varied choice of rhythmic motifs. Playful tone. Rossah 2:40 U.S.A. No Not applicable Low-key. Medium-speed maqsoum. You prefer acoustic instruments rather than electronic synthesizers. You particularly like violin and flute playing Middle Eastern music. You feel energized by music that was recorded in a live performance, with audience applause. You enjoy the style of dance that was popular in the U.S. in the 1970's,, and you're looking for suitable music appropriate to that style. You like a "party in the village" style of music where it feels like a group of friends have gotten together for a jam session, as opposed to a slick production. You like music with extensive improvisation and embellishment around the melody line. You're already a fan of Troupe Americanistan from seeing their live performances in the Oregon area, and you'd like a copy of their music to work with on your own. You love pop music played on electronic instruments. You prefer music which was originally made popular in the Middle East rather than original compositions by musicians in North America. Your favorite music consists of slick 40-piece orchestras playing from set scores, as is the case with much "classic" Egyptian music. You prefer music that offers a crisp presentation of the melody line, with minimal embellishment. You're not fond of violin and flute being used for Middle Eastern music. The music makes an interesting change of pace for American tribal-style performances. It's not as well known as some of the other recordings that tribal dancers use and therefore it brings a fresh sound to events when used. There's a large amountof music on this collection: almost 73 minutes, to be precise. (The maximum that a CD can hold is 74 minutes.) Assuming you like this group's style, this album offers a good value for your money. Although I usually don't care for recordings of live performances, I appreciate this one because the musicians managed to convey a level of energy and spontaneity which is often missing from studio recordings. Also, it did not have the excessive amount of applause, joking, or chatty introductions which have annoyed me in other live performance recordings. In a couple of songs ("Serpentine" and "Sword Dance"), the music starts slow and dramatic, then gradually builds into a medium-speed tempo. The performers handle these transitions quite subtly and skillfully. Each song is an individual track. This makes it easy for a dancer to pick and choose which songs to use in the order that best fits the needs of the moment. The sound quality is good--although it lacks the polish of a studio recording due to being taped on location at a live performance, it's still good enough to use in performance settings. The musicians employ a variety of instruments across the various songs. This results in a collection of music in which each song has a distinctive sound but still everything can be used comfortably together in the same performance without clashing. The music includes two 9/8 songs and a 6/8. I'm always happy to discover a recording that offers these alternative rhythms to spice up a show. Many of the songs were in the range of 3-4 minutes long, which is convenient for dancers when assembling a group of songs into a show. For American audiences, the Top 40 radio format has indoctrinated people into having attention spans that start to drift when individual songs exceed this length. This is also a manageable length for beginner-level performers who might not have the skill to sustain an interesting dance for a longer piece of music. In some cases, the musicianship could have benefited from more precision. For example, one of the reasons I didn't care for the performance of "Aziza" on this album was because I've always preferred crisp arrangements of that song. On this recording, the musical interpretation leans more toward a flowing, lyrical style with assorted embellishments around the melody line rather than the precise, energetic style that I prefer for that specific song. I acknowledge that your taste may be different. In a couple of songs, the violin sounds as though the musician is trying to find the correct pitch of the note. Someone else might like this effect, thinking that it conveys the mood of a "party in the village". This album could be an interesting choice for the American Classic style of belly dance. A number of the pieces on this album are original compositions by the musicians, played on traditional instruments. This could be attractive to dancers who are looking for fresh music different from what everyone else is using. I originally met Dunya al Hannah, one of the producers of this music, through an Internet discussion group about Middle Eastern dance. Although we didn't develop a close relationship through this, I did come to know of her as an interesting member of the dance community who often expressed opinions that I respected. When Dunya contacted me to ask if I would be willing to review her group's new CD for my web site, I accepted the complimentary copy that she offered me. I still don't know her very well, but I do still appreciate the contributions she makes to the dance community.